Tom Maclay sought out some of the most experienced resort planners in the world to propose an approach and philosophy guiding development of Bitterroot Resort. He wanted to create a model for sustainable development within the Bitterroot and Missoula Valleys and beyond. Due to the large expanse of private land holdings under a single ownership, the planning team was presented with a unique and blank canvas. The Bitterroot Valley is presently being developed through the basic subdivision of private land. Typically, large private land parcels are subdivided into smaller parcels, which in turn get subdivided into individual lots. The end result is the construction of mostly single-family homes on large lots serviced by wells and septic fields. Each home is surrounded by its own private open space, yet due to the lack of consolidated land holdings and the subdivision process, little commonly owned open space typically occurs between the natural landscape and the built environment. The result is neither rural nor urban development. The structures are too spread out for the pedestrian to consider it his/her domain while being too built up to retain the natural beauty of the land. The end result is a car-dominated settlement pattern that promotes automobile usage over walking and leads to higher public safety costs (policing and fire safety) as well as higher on-site and off-site infrastructure costs (sewer,water and power/individually serviced lots). The end result is more demand for roadway capacity leading to an on-going cycle of roadway expansion to facilitate the movement of the automobile. Not only does this pattern development incur greater damage to the native landscape (consumption of land, particularly agricultural and timber lands), it creates more harm to the environment (more impervious surfaces and automobile emissions). Furthermore it creates a greater burden on local government through additional maintenance and infrastructure costs. 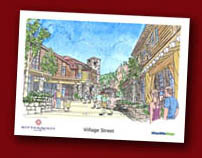 The planning team is inspired by both the need and the potential to create a new type of development within the Bitterroot valley; one that preserves open space, creates greenways and wildlife habitat, and promotes pedestrian movement and social interaction by its inhabitants; all while creating opportunities for employment, entrepreneurial business creation; an expanded and sustainable tax base; public art; cultural attractions and events, and of course a diverse offering of winter and summer recreational opportunities. © Bitterroot Resort 2007. All Rights Reserved.